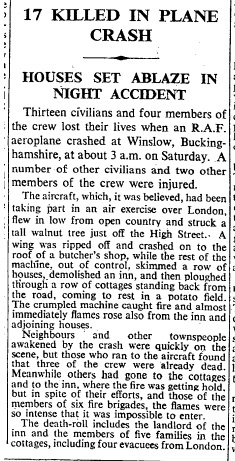 The plane ploughed through the Chandos Arms in the High Street and the adjacent house (no.82), then hit Rose Cottages, a row of four houses behind the High Street, of which three were burnt down as the plane caught fire. Several people in the houses were saved by their iron bedsteads. 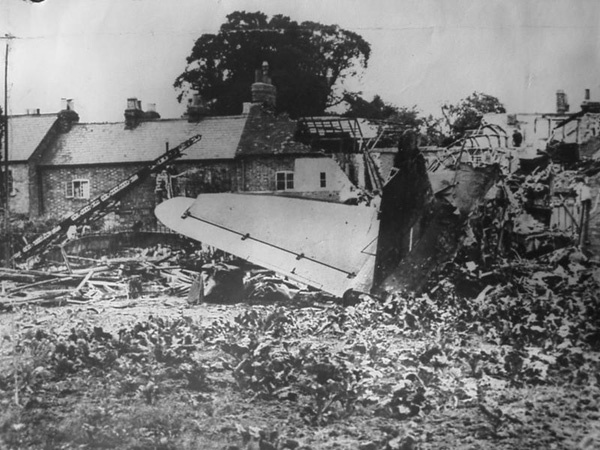 The remains of the plane ended up in the gardens behind the cottages. 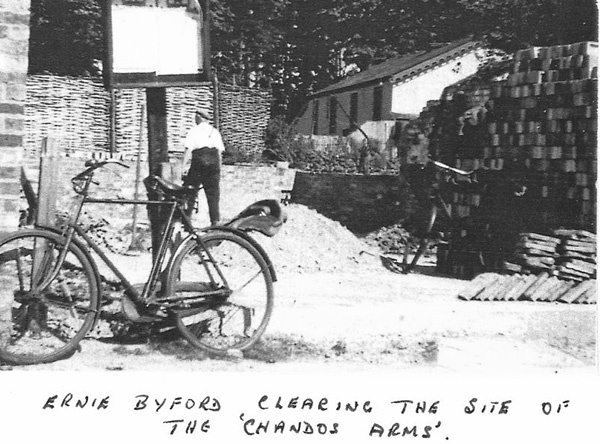 The map shows the Chandos Arms ("P.H.") and Rose Cottages (the four houses top right), east of the High Street. The Oddfellows Hall (bottom right corner) is in roughly the same place as the present Public Hall, but the rest of the site has been replaced by Elmfields Gate, modern buildings and the car park. 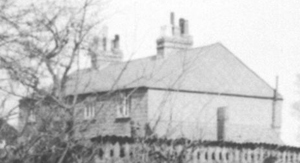 The photo on the right, taken not long before the disaster, shows Rose Cottages from the footpath near the Oddfellows Hall. The houses in the photo are in the High Street. Rose Cottages have disappeared beneath the plane. On the night of 6/7th August 1943 I was the navigator of Wellington Bomber X3790. Wilfred Davies was pilot with Johnny Sowter bomb aimer. The wireless operator air gunner was John McKeon who had replaced Samuel Smith, killed on 31st July. The rear gunner was Carl Fietz, an Australian, locum for our regular gunner who was hospitalised. We took off from Little Horwood airfield (which is at Great Horwood!) on a training bombing exercise. We had already secured the Bomber Command record for bombing with an average error of 30 yards, with eight bombs from 10,000 feet at night but we were hoping to better the record. When we were approaching the bombing range Johnny Sowter discovered the bomb sight to be defective and we aborted the exercise and altered course for base. During the subsequent approach down the glide path to the runway I heard the pilot say he had ‘got a red’. Now there were a number of things which that could indicate. A Verry light from the airfield controller, being off the glide path or maybe some instrument reading. My compartment in the Wellington was just in front of the main spar and thus I was unable to know exactly what was occurring ‘up front’. The pilot called to Johnny to help him and I monitored my instruments that showed a very low airspeed and height. We seemed to waffle and yaw about for a couple of minutes and then there was a thump! The time was 2.55am (August 7th the day before my nineteenth birthday). I awoke on the edge of a conflagration the like of which I had never seen and to the sounds from a nightmare. I managed to attract attention to my position by blowing my whistle and some men came and lifted me over some spiked iron railings and took me to a cottage. I had lost my senses for I had not the remotest idea where I was - which country - was it Germany? I ask the people in the cottage "where was I?" but they seemed reluctant to say. I said "is this England? 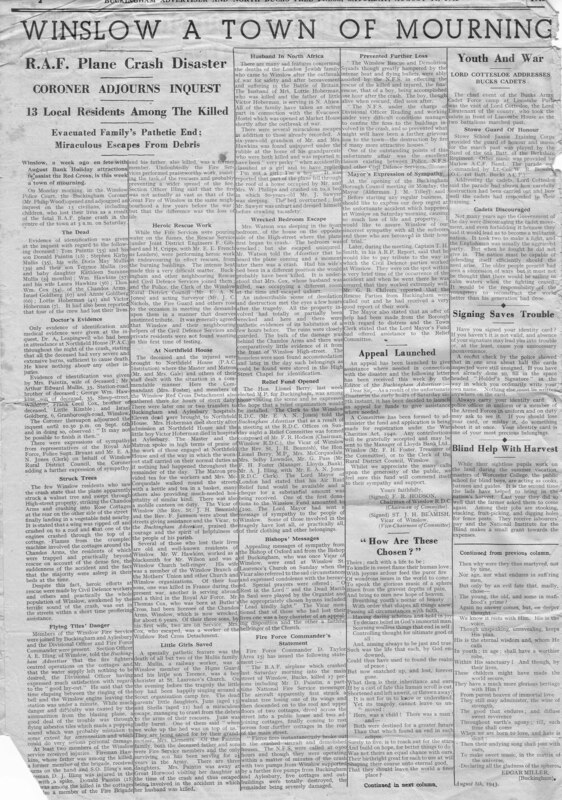 "’ They replied in the affirmative and I knew all would be well. I was offered succour but declined any treatment to my burns until the RAF ambulance arrived. I was injected with morphine and taken to Halton hospital where I remained for some time. At the 50th anniversary memorial I introduced myself to two ladies, June Ridgeway and Sheila Barnes, who had been the Mullis sisters aged about five or six and were the only survivors of their family living in Rose Cottages. Their story was revealed in a television interview and in talks with me. I contacted the Veterans Agency on their behalf and they were subsequently awarded war disability pensions. 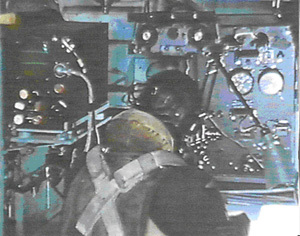 The picture above is of a navigator in a typical navigator’s compartment, not a Wellington though. Some of the aftermath is shown in the photo below. The building in the background is the Oddfellows Hall. An RAF court of enquiry found that the accident was due to the pilot losing control through not concentrating on his instruments and allowing the aircraft to fly too low, and blamed Flying Control for allowing crew with insufficient experience to participate in night flying exercises. A special service to commemorate the 50th anniversary of the disaster was held at Winslow in 1993, and made the regional news. Click here to see the Meridian T.V. report.